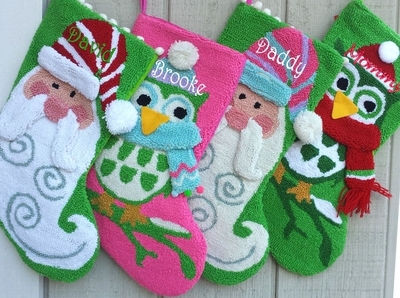 20" Hooked Christmas Stockings with Lime Green Christmas Red and Pink Hot Pink Cute Owl, Whimsical Christmas Santa Custom embroidered personalizing **FREE OF CHARGE**. They are just fun and funky stockings that will certainly brighten up your holiday decor. Measured Diagonally from the top left hand corner to the toe, the stocking measures 20.5 inches, and the width along the cuff is 9 inches. This is a large personalized Christmas stocking that is plenty wide to fit lots of presents. Materials: Hooked Stockings - Wool Acrylic Blend, Canvas and Linen as well as Felt. Lining: The Christmas stocking is lined- inside on the front. The Back is constructed from nice thick felt.